Quality Door & Hardware, Inc. announces the Sargent 10 Line Cylindrical Locks as one of its featured product lines for January 2013. 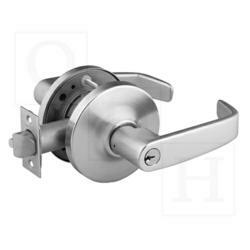 Quality Door & Hardware, Inc. is pleased to announce, as one of their featured product lines for January 2013, the Sargent 10 Line Cylindrical Locks. Jeffrey N. Dinardo, Sr., owner of Quality Door & Hardware, Inc., recommends the Sargent 10 Line Cylindrical Locks for their durability, ease of installation and flexible design. The Sargent 10 Line cylindrical locks are heavy duty cylindrical key-in-lever handle locksets featuring both strength and security and are rated at 5 times A156.2 Series 4000 Grade 1 standards. At over 4 million cycles, the Sargent 10 Line beats the competition by 30%. The Sargent 10 Line is user friendly, installs in 1 minute or less and is designed to fit a variety of door preparations with adaptable through-bolt positioning. The solid feel and precise lever action; together with available decorative one piece cast construction levers and classroom security and multiple locking functions, make the Sargent 10 Line the ideal choice for use in offices, schools, hospitals and manufacturing facilities.